What strikes me about the Japanese relationship with fried chicken is the frequency of consumption—more often than a once-in-a-while indulgence. In America, eating fried chicken every day is viewed as gluttonous behavior. The same practice in Japan is met with gentler judgment. Their style of fried chicken is called karaage (pronounce kara-ah-geh), sometimes known as tatsuta-age. And I’m convinced the Japanese have fine-tuned the art of chicken frying better than any culinary culture. 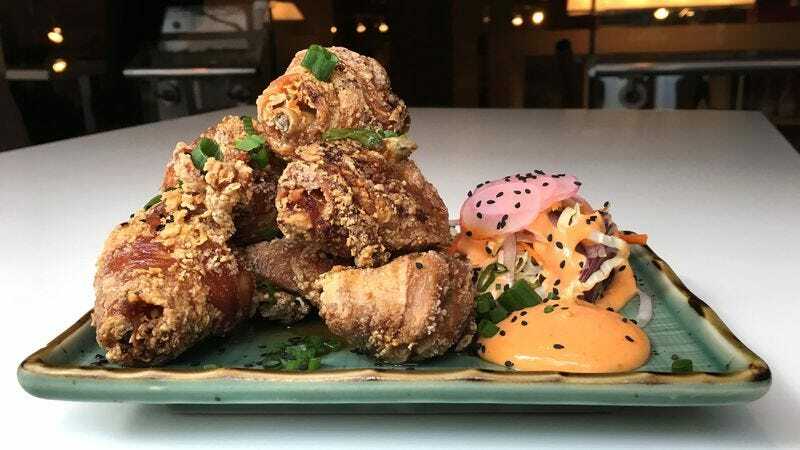 One of the best renditions of karaage I’ve sampled can be found at a downtown Chicago Japanese restaurant called Slurping Turtle (there’s a sister location in Ann Arbor, Michigan). Theirs is fried in duck fat, and it’s their number one seller for good reason. When I take a bite, it activates the same pleasure centers as the first time I tried the dish five years ago. It’s crackly crisp, juicy as only dark-meat chicken can be, with a tart zing from a squeeze of lemon, and a rich, savory aroma imparted by the duck fat. It almost always uses dark meat. Any time menus proclaim “100 percent white meat” (especially with chicken nuggets at fast food chains), I see it as marketing flimflam duping consumers into believing they’re eating something healthier. If you’re deep frying chicken, you might as well go for the most delicious cut. And that’s thighs and drumsticks. The Japanese will also use wings for karaage, but perhaps tastiest of all is a part of the chicken rarely consumed in America called nankotsu—the crunchy cartilage between the breast meat. The chicken is cut into manageable and similarly sized pieces. The most crucial consideration of fried chicken is its crispy exterior-to-meat ratio. The default way in Western countries of breaking down a chicken is to divide it in eight pieces, with two wings, drumsticks, thighs, and breasts. What this means is each cut requires a different cooking time—wings take the shortest, breast pieces the longest (though some cooks have taken to dividing the breast pieces in half again). Because karaage pieces are cut into a uniform size, you can cook a whole serving quickly and in one go. The chicken is aggressively marinated. If certain Japanese food tastes “Japanese,” there’s a good chance it’s the trinity of soy sauce, sake, and mirin. This combination renders marinated foods savory with rounded sweet notes. Karaage gets marinated in this flavoring trio with minced ginger and garlic. Most recipes I encounter suggest the chicken be soaked in this marinade no longer than 30 minutes; that’s enough time for the chicken to absorb its bold flavors without becoming over-salted. The chicken is dredged and fried with potato or corn starch, not flour. In Japan, there’s a robust culture of to-go food served in basements of department stores known as depachika. It’s the indoor, air-conditioned equivalent of street food at an outdoor market—and far more sanitary. There are minimal accompanying sauces. As much as I love Korean fried chicken (with its sticky-sweet glaze) or Buffalo wings, Japanese karaage allows the chicken to shine and not get lost beneath an overbearing sauce. Typically, a squeeze of lemon suffices, but Kewpie mayo—richer and with more umami flavor than its American mayonnaise counterpart—is also a popular dip. Using a sharp knife, separate the thighs from the drumstick by cutting between the joint. Cut the thigh in half lengthwise along the bone. Using a heavy cleaver, chop the piece with the bone in half, resulting in three similar-sized pieces. Then, cut the drumstick in half through the bone. When you’re done with all four thigh quarters, you should have 20 pieces of chicken when done. Alternatively, debone the thigh pieces with skin intact, and cut into two-inch pieces. Place the chicken in a shallow pan and set aside. For the marinade, combine garlic, ginger, soy sauce, mirin, sesame oil, and a few grinds of black pepper in a bowl and mix. Pour marinade over chicken and coat well using your hands. There should be just enough marinade to coat the chicken. Cover and refrigerate at least 20 minutes or up to two hours. Line a shallow tray with paper towels and set aside. Heat six cups duck fat (or vegetable oil) in a heavy-bottomed pot over medium-high heat until the oil reaches 325 degrees Fahrenheit. Place 1 cup potato starch in a large bowl and gently toss each piece of chicken until lightly coated. Carefully lower half the chicken pieces into the hot oil. Cook the chicken until it is nicely browned and begins to rise to the surface, 9 to 11 minutes. Once the chicken is cooked through, remove it from the oil using tongs and place onto paper towel-lined tray. Toss with a pinch of kosher salt while still hot. Repeat with second batch. Serve immediately with lemon wedges and Japanese mayonnaise. Combine all ingredients and stir until sugar is dissolved. What The Hell Is The Hopewell Fund?